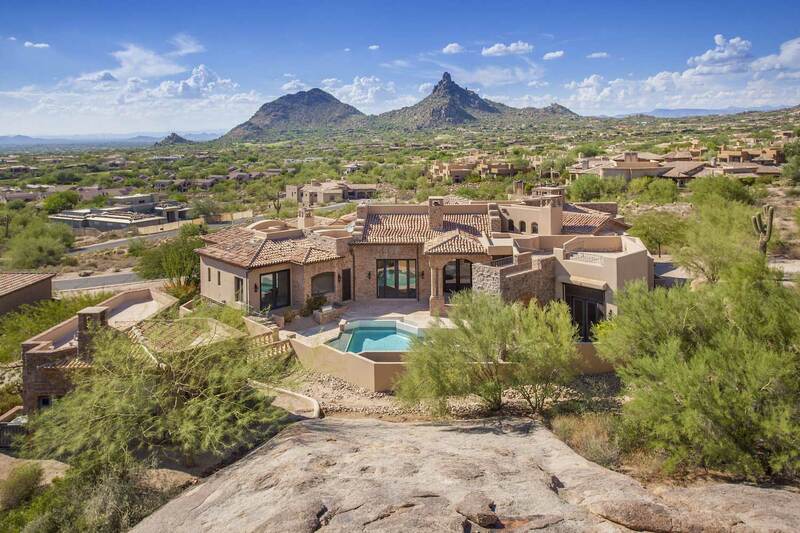 Situated on a gentle elevation, with breathtaking 360-degree views that include Troon Mountain and Pinnacle Peak, Shadow Peak is a striking Tuscan style estate in the prestigious guard-gated Artesano community at Troon, and will be offered at a luxury no reserve auction on November 3rd with Supreme Auctions in cooperation with Joe Monnig of Berkshire Hathaway Home Services Arizona Properties. Stone and hardwood finishes inside and out give the home an old world elegance, while modern amenities provide all the comforts you’d expect from a home of this caliber. Rich wood exposed beams, canterra and stone fireplaces, a state-of-the-art home theater and a tuscan-inspired wine cellar are just a few of the unique features that you will discover within this outstanding property. The expansive master wing’s private balcony, sitting area, and his and her amenities makes it the perfect retreat. An oasis in the desert, the estate features a cascading waterfall, a stunning pearlized mosaic tiled pool, and an observation deck; all surrounded by impressive boulder formations and breathtaking views. Completing the grounds is a separate guest-house, that includes a master suite, living room and kitchen. 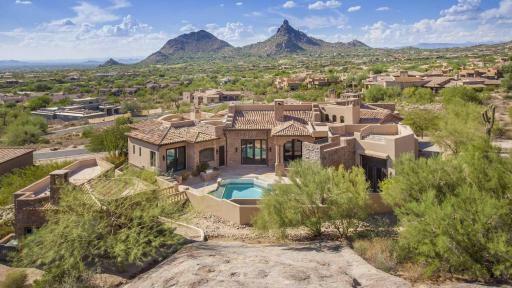 “With views that include 50 miles of city lights, the Sonoran Desert and Pinnacle Peak, taking it all in is a truly awe-inspiring experience,” says the current owner. The auction is yet another example of how Supreme Auctions’ accelerated marketing strategy, tailored to each specific property, is transforming the luxury real estate market. While Shadow Peak enjoys an elevated location in Artesano, it is still within minutes to the heart of Scottsdale and its vibrant dining, shopping and entertainment scene. Along with the world-renowned Troon Country Club, there are dozens of golf courses within 15 miles of the home. Scottsdale itself is home to corporate headquarters, the world-renowned Mayo Clinic, and WestWorld’s first-class equestrian center and annual Barrett-Jackson collector car auction. Shadow Peak will be sold at a luxury no reserve absolute auction on November 3rd, 2016. Interested parties can contact Supreme Auctions directly at (866) 929-2243.